This chapter outlines the background to the development of changed pedagogy by mathematics teachers within a secondary school in England. It relates this development to the enhanced understanding of the use of interactive whiteboards, initially as a presentational and motivational support but then as the basis of more effective conceptual and cognitive learning by students. The experience of teachers within the school and members of a research group points to the importance of the integration of interactive whiteboards, desk work and thinking in the planning of mathematics lessons. 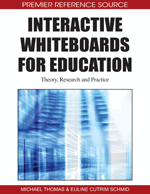 It also discusses emerging evidence that effective whiteboard use requires an understanding of the role of individual learning style, gesture, and artifact use in reflective and stepped teaching and learning situations.